Are you saving money? Are you productive? Are you using ScienceDirect? For corporate researchers in particular, ScienceDirect enables you to meet these challenges by connecting you to the latest scientific developments so you can make better decisions, more quickly and confidently. In an independent study conducted in 2016, 88% of corporate researchers report that ScienceDirect saves them time. Here are just a few examples to show how ScienceDirect saves time and helps advance the work of your industry colleagues. Find out what other researchers have already done, so you won’t need to repeat it. A researcher in pharma R&D management needed to gather data and test conditions for existing ion channel blockers to support in vitro screening efforts. ScienceDirect expedited compilation of a dataset of over 30 compounds blocking the target channel. Quick access to the existing data saved several months of time and made it possible to develop the SAR to inform the design of new ion channel blocker drug candidates. Gain access to ideas in other disciplines/markets that inspire innovation and solutions. A researcher in pharma technical management faced a problem with long-term changes in a product’s performance. ScienceDirect enabled the researcher to locate multiple articles supporting a possible mechanism and to design experiments to confirm it. By applying knowledge from non-pharmaceutical studies, a raw material aging mechanism was identified, salvaging the product launch and saving over $20 million dollars. Make sure you don’t overlook critical information supporting your research. A biotech engineering project manager needed to keep up-to-date regarding developments in plant biology research. ScienceDirect streamlined the research methodology, making it easy to identify relevant articles and publications. This knowledge supported improvement of project strategies and helped drive an effective go/no-go decision, resulting in a successful product patent. How will you be inspired to use ScienceDirect? 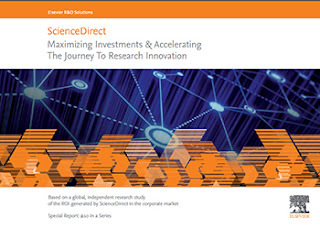 Check out the 2016 global study by Martin Akel & Associates to see how other corporate researchers benefit from ScienceDirect. Maybe you’ll discover a new way to drive your projects forward faster.